In my consulting around the country, I have yet to walk into an office that didn’t know how to do what they do. They’re all great at dentistry. Most are very good at answering the phone, setting appointments and interacting with patients. That’s not to say that every practice – and I really mean every single practice – can’t improve its skills, systems and protocols (there is always room for improvement!). But normally, when a dentist brings me in to teach him or her how to run the practice like a business, the issues that usually come up are centered around the politics of the office and teamwork. We’ve all seen the posters hanging around business offices with images of skydivers in formation that say some inspirational quote about working together. 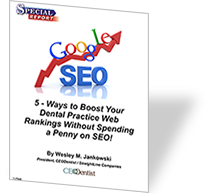 Those images are so common for a reason: it really does take a group effort to create and sustain the kind of success you want with your dental business. The group must have a commitment to team results over individual issues. The problems, personal agendas, conflicts and drama that arise are inevitable; put any group of humans together and those issues will come up. In fact, I went back and looked at the attendee evaluation cards from speaking events that I’ve collected over 14 years of consulting in the dental community. The top issues in every practice (according to dentists and team members) is communication, and accountability, and teamwork... or lack thereof. The other two are hygiene profitability and Treatment Acceptance. Since we’re talking about “teams,” I’m going to use a sports analogy for this article. Have you ever noticed that the same NFL teams are always in the playoffs? It’s never really a surprise when the Patriots and Green Bay are battling for top ranking. How about baseball? St. Louis Cardinals (5-years in a row) and the San Francisco Giants. It’s not a mistake. Those teams truly work as a unit to accomplish a singular goal. And by the way, it doesn’t seem to matter how many superstar players join the team, either, because it’s not about stringing together a team of superstars who each work individually. It’s about unifying individual players into a group that thinks together, moves together and succeeds together. Does it sound hard? It can certainly take effort. But the good news is, when you create a structure for accountability and support, your team will make it to the playoffs every time. Your frontline leaders are your first team. When you create a culture of accountability, loyalty and integrity/confidentiality with these people, it will trickle down into the departments. I’m currently working with a practice that is a merger: one doctor bought a practice from a retiring doctor. With the merger, the young doctor took on a bunch of team members along with the new book of patients. The challenge for this particular situation is that the philosophies of the two practices don’t necessarily match. They were different in most areas, from how they manage their employees, to how they work together, to how they present treatment options and even how they answer the phone. These two practices were very different, and both successful in their own right. However, now that they are working together, both sets of team members are very righteous about how they do business as opposed to being passionate about banding together to succeed at a common goal. Of course, they've only been at it for a couple of months now, so this sort of struggle could be expected. But, everyday at least some of the staff members are going to be "new" to every patient coming through the door. It's imparative that they work through their disagreements, drop phrases like, “your practice" and "our practice,” and start fine-tuning systems and protocols to take advantage of the talents and skills of all the team members. At this point, the most important thing the young dentist could do (and is doing) is to recruit the heads of the departments into the culture of accountability, loyalty and integrity/confidentiality. Once the doctor has brought those department heads into alignment with one another, the rest of the squad will either fall into place or leave. Most often, when practices struggle on a day-to-day basis with teamwork and collaboration it is due to a lack of leadership. When the leadership fails to be clear, focused and unwavering, there is room for internal struggle to arise. Strong leadership sets the standard for every team. If your leaders undermine you, compete with each other or demonstrate any kind of behavior other than professionalism, they will allow for that behavior within the entire team. You Cannot Tolerate any Bad Behavioral Issues. It Absolutely Tears Away at the Fabric of the Practice. Here’s how you can get a sense of how healthy your team is: go to any team meeting, any huddle or even a team lunch where members of your staff are gathered and interacting with each other. Watch their behavior closely to gain insight into the dynamics of the team. Are they energized, contributing, spirited and having fun? Or are they sitting back, doodling or worse – texting or emailing (you don’t allow cell phones in your meetings, do you!?)? Notice if they’re yawning or slouching. Do you let that kind of behavior slide? Or do you call it out and get it cleaned up? Here’s a big fat myth that I’d like to call out right now: teamwork just doesn’t magically happen... you and your team leaders build teamwork strategically. It’s your job to foster a community of people who are on the same page – and letting an eye roll slip by today or an exasperated sigh sneak in tomorrow only creates a feeling of distrust and disengagement among your players. Why is this so important? Because when employees respect the leadership of their organization, they’re much more likely to give you their best and encourage the best in others as well. When they respect you and your team leaders, they respect themselves and they respect your mission. 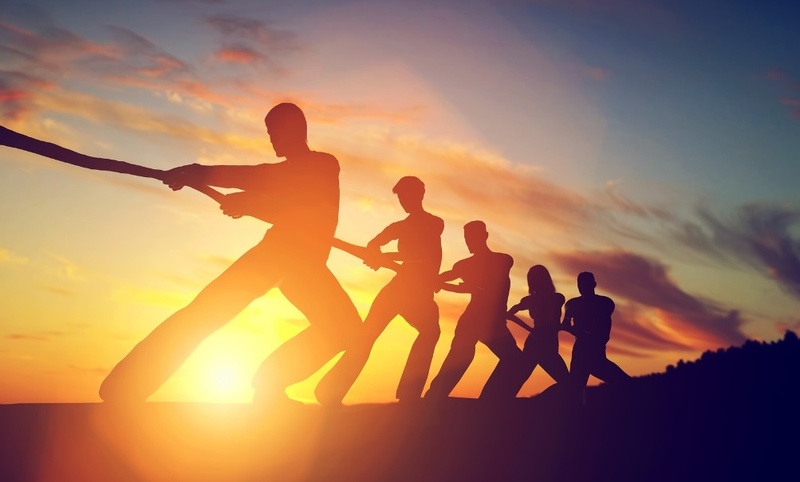 Get Your Team Working Together - "The Idea Game"
I have the priviledge of being friends with the Dr. of one of the top-dental practices in Denver. His staff does an incredible job of creating a sense of teamwork by playing “The Idea Game.” Every 2-weeks they draw names out of a hat and divide up into two groups. During the morning huddle, that brief period of time where they get together to discuss how they will orchestra the day (“Here’s what we’ll work on today, these are the patients coming in and their special conditions...” etc. ), they take a minute to share any new ideas that improve the efficiency, productivity or patient experience in the practice. They keep a ledger/record for the month of all the ideas. The morning huddle isn’t a time to quantify, justify or protect anything about the idea – it’s just simply a time to bring an idea to the table. Then, once a month when the team gets together, they spread out all the ideas on the table and select some to work on in the practice. This encourages team members to get involved and participate. At the end of the month, the people who bring the most ideas – not the best ideas, not the ones the get implemented, just the most – get a pair of movie tickets per person. Now is that a great way to encourage engagement and excitement among your employees or what? If The Idea Game sounds like the last thing your team would be willing to try out, we should really talk [Contact Us]. Creating a solid team is truly your ticket to success in the dental game, and I want you to get there just as much as you want you to get there!